You are here: Home / Education / MO Senate GOP to move on conservative agenda with Republican Gov. 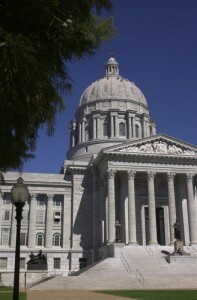 MO Senate GOP to move on conservative agenda with Republican Gov. State Senate party leaders outlined their agendas shortly after gaveling out on the second day of the 2017 legislative session Thursday. Republicans, who dominate all three branches of the government, indicated conservative priorities would see quick action. Senate President Pro Tem Ron Richard of Newton said making Missouri a right to work state would be the first order of business. Richard stated that right to work legislation for state employees would also be presented, but in a separate piece of legislation. The measure slated to first be debated in the Senate is sponsored by Republican Dan Brown of Rolla, and is being sent to the General Laws Committee. After years in which Democratic Governor Jay Nixon vetoed right to work proposals, Greitens has made passing the legislation a top goal. A right to work law would allow employees to opt out of paying union dues. Minority Floor Leader Gina Walsh of St. Louis County thinks the legislation would hurt workers and thinks Republicans are hypocritical in supporting it. Despite issues such as right to work which sharply divide the parties, Senate Democrats are signaling a willingness to work with the chamber’s Republican supermajority and incoming GOP governor. Walsh says she’ll try to get bipartisan proposals passed in the senate, while she’ll still oppose the key Republican priorities. Richard says they include loosening government regulations, offering private options for public education and minimizing liability lawsuits. Those issues will follow right to work on the Missouri Senate’s agenda. Although Republicans are poised to make sweeping changes with a new GOP governor, there’s disagreement on some issues. Senate leader Richard won’t support Greitens plan to make lawmakers wait an equal amount of time they spend in office before allowing them to become lobbyists. In addition, Richard says some Republican senators oppose Greitens plan to impose a ban on all lobbyists gifts to lawmakers. Greitens made fighting corruption in Jefferson City the center piece of his campaign, and often spoke of reigning in lobbyists as means to do so. Richard also released committee appointments Thursday. Senator Brown will chair the Appropriations Committee, which handles budget issues. Senator Bob Onder of Lake Saint Louis will head the General Laws Committee, which will see the right to work measure. Ways and Means, which deals with taxes, will by chaired by Senator Will Kraus of Jackson County.